Strikeforce Mining and Resources (SMR), a molybdenum miner owned by Oleg Deripaska, failed last week in its second try at attracting Chinese and Hong Kong market investors. The first try was in October 2008, when Morgan Stanley and the Bank of China were the arrangers. But that month, as Deripaska’s aluminium company Rusal and his Basic Element holding plummeted towards a series of loan defaults and debts totaling more than $20 billion, the SMR share sale was abandoned. Last week, it was revived again at a roadshow in Hong Kong. But Morgan Stanley had dropped out. Instead, the three arrangers were the Bank of China, Deutsche Bank, and the Moscow investment house, Renaissance Capital. The target for the initial public offering was to raise between $150 million and $200 million. The chief executive of the Hong Kong Stock Exchange, Li Xiaojia, refuses to say whether the exchange’s Listing Committee had reviewed and approved the listing application and prospectus for SMR. But in a sign the exchange was ready to authorize the share sale, Li had authorized the issuance of a stock ticker for the company (SMR) and a stock code (977). The Hong Kong Exchange has faced sharp criticism in the local market for its special treatment of the listing of the Russian aluminium monopoly, United Company Rusal, whose controlling shareholder is also Deripaska. Li has privately defended the restrictive listing of Rusal on January 27, based on a series of waivers of the applicable regulations; exclusion of retail investors from buying the stock; and in the first weeks of trading, a bar on short-selling. Despite these controls, Rusal ‘s share price dropped 11% on the first day from the IPO fix of HK$10.80. It continued to fall to a low of HK$7.50, 31% below the IPO listing level. On improving sentiment for the price of aluminium, it has recovered modestly, but still remains more than 20% below listing. It also trails behind internationally listed aluminium peers, Alcoa and Chalco. Despite the rebuff of SMR, Rusal was up at HK$8.36 today. Yet very little volume of shares is traded, in part because of the trading restrictions imposed by the exchange; and in part because the anchor shareholders, who guaranteed the listing in January and hold the majority of the unusually small 10% free float, are Sberbank, the Russian state savings bank; Vnesheconombank (VEB), the state bailout bank; the Libyan Investment Authority; and four other shareholders with special relationships with Deripaska. Li, the HKEx chief executive, has said privately that Deripaska should be treated like other Chinese moguls whose shares are approved for trading on the exchange. 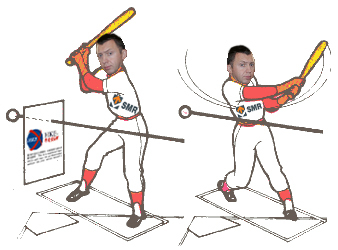 The outcome of the SMR listing suggests that without a sign of Kremlin backing for SMR, few agree with Li. When SMR renegotiated its debts a few weeks ago, the lending syndicate of BNP Paribas, ING, Raiffeisen, Royal Bank of Scotland (RBS) and Alfa-Bank of Moscow agreed to a deal on a four-year loan to cover the $122 million owed by SMR, with a 15-month grace period on principal debt repayment. But there is no sign that, except for Bank of China and Deutsche Bank, the bankers who had tied their loan refinancing agreement for Rusal to partial cash repayment through the share listing, want to do so again for SMR. The banks BNP, ING, Raffeisen, and RBS are also revealed in the Rusal prospectus as earning substantial payments on zero-price share warrants they took at the listing, which they may sell in July. The first part is true, but US Geological Service USGS) reports cast doubt on the second. According to the USGS report on molybdenum worldwide, released in March of this year, Russian production (meaning SMR) of molybdenum in 2008 was 3,600 tonnes; in 2009 the output fell to 3,400 tonnes, according to the latest USGS bulletin. Russian reports claim that production may have been one thousand more tonnes. But in global terms, Russian mining of molybdenum is still so small that neither the country nor SMR has earned a mention in the USGS handbook, the molybdenum mining bible, for the year 2008. In the promotional press ahead of last week’s Hong Kong roadshow, Bloomberg reported SMR as claiming to be the fifth largest molybdenum miner in the world. According to output volumes, the largest are in fact: Freeport McMoran Copper & Gold, Codelco, Grupo Mexico, Rio Tinto, China Moly, Jinduicheng, Antofagasta Plc, Thompson Creek Metals Company Inc., Antamina S.A., Collahuasi SCM. The InfoMine website reports the most actively traded molybdenum producers in the market at present are: Rio Tinto, Teck Resources, Taseko Mines, Thompson Creek Metals, Roca Mines, Golden Phoenix Minerals, and Win-Eldrich Mines. Molybdenum, whose chemical symbol is Mo, was first recognized as an element in 1778. Until that time, the mineral molybdenite—the most important source of molybdenum—was believed to be a lead mineral because of its metallic gray color, greasy feel, and softness. In the late 19th century, French metallurgists discovered that molybdenum, when alloyed with steel in small quantities, created a substance that is tougher than steel alone and is highly resistant to heat. The alloy has subsequently proved to be ideal for making tools and armor plate. Today, the most common use of molybdenum is as an alloy agent in stainless steel, alloy steels, and superalloys to enhance hardness, strength, and resistance to corrosion. about 14 million tonnes in the rest of the world. It occurs as the principal metal sulfide in large low-grade porphyry molybdenum deposits, and as an associated metal sulfide in low-grade porphyry copper deposits. China leads the world with molybdenum reserves of 3.3 million tonnes; the US comes next with 2.7 million tonnes; Chile ranks third with 1.1 million tonnes; Canada is fourth at 450,000 tonnes; and Russia is in fifth place with 240,000 tonnes. That last number makes about 2% of the world total. Like aluminium, molybdenum production is highly concentrated in the world marketplace, but unlike Rusal, SMR isn’t a candidate for a dominant, let alone leading producer. It has been reported that in 2008, before the price of molybdenum crashed, SMR was valued at $700 million. It isn’t clear from the latest press reports what size stake in the company SMR planned to offer on the HKEx this month, in order to raise the target of $150 million to $200 million. But the regulation limit for a retail listing on the HKEx is 20%. If SMR intended to offer a 20% shareholding for sale, that suggests the underwriters were hoping to convince investors to value all of SMR at a premium to the pre-crash value, or between $725 million and $1 billion. 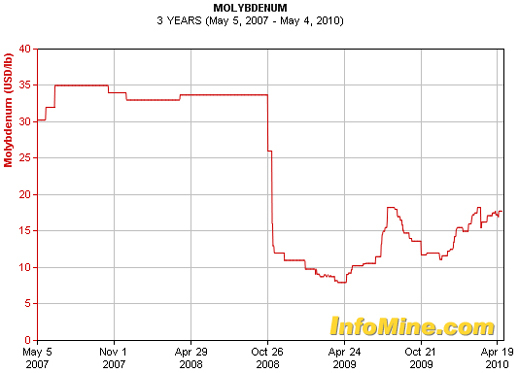 But molybdenum is currently trading at half the price it was at when SMR thought it was worth $700 million in 2008. Given that the prospects for Chinese and global steelmaking and steel prices are currently looking flat to downwards for the quarter ahead, the future forecasts for the molybdenum price are riskier on the upside than the downside. In 2008, the future for molybdenum appeared to be one of deficits of supply until 2011, when surpluses would start to press downwards on the metal price for at least three years. This gloomy prospect was brought forward hurriedly when the crash came. Not only that. Although SMR has yet to issue audited public accounts, public production reports, and reserves tested to western standards, a simple comparison with Thompson Creek Metals (TCM.TO) suggests that on the fundamentals, SMR went to the Hong Kong market last week with an exaggerated sense of its worth that was unsustainable. The available data suggest that SMR, with annual production of 7.5 to 8 million pounds, could not approach Thompson Creek Metals which turned out just over 25 million pounds in 2008, and just under that in 2009. By the end of last year, Thompson Creek Metals reported debt of just $13 million, roughly one-tenth of SMR’s debt level. 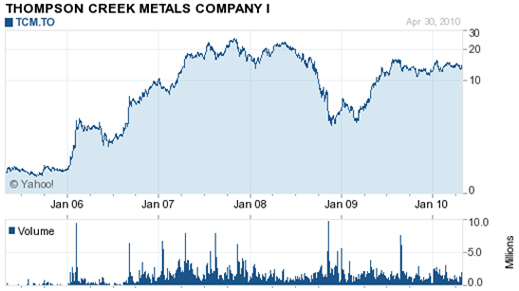 At its current share price, Thompson Creek Metals is valued in the market at C$1.6 billion ($US$1.5 billion). In the review of both Rusal and SMR, the Hong Kong Securities and Futures Commission, as well as the HKEx, were obligated to review the fitness and compliance criteria in the Hong Kong regulations in relation to the controlling shareholder, Deripaska. On this front, there are new developments. In parallel, the evidence record in that case has been requested by a judge of Spain’s Audiencia Nacional, Fernando Andreu, and Madrid prosecutor, Jose Grinda. According to their spokesman last week, they are planning to come to Moscow in May to “take statements from Deripaska for an offense of conspiracy and money laundering as well.” The Spanish investigation is focusing on the history of Deripaska’s asset acquisitions, and the methods and partners he used. Cherney and Iskander Makhmudov, Deripaska’s original partners according to the High Court evidence record, have also been issued Spanish summons for questioning. The Spanish judicial investigators have also formally requested the UK Government to assist their investigation by providing copies of the High Court evidence in the Cherney case, plus what a Spanish judge refers to as a report on Deripaska prepared by the Financial Services Authority (FSA), at the time Rusal was considering a listing on the London Stock Exchange in mid-2007. The existence of the FSA report on Deripaska has not been confirmed in the open before. It poses a due diligence and regulatory problem for the HKEx, and also the Securities and Futures Commission, if they are to defend their regulatory approach as the equal of other major exchanges, and no less a protective standard for investors.